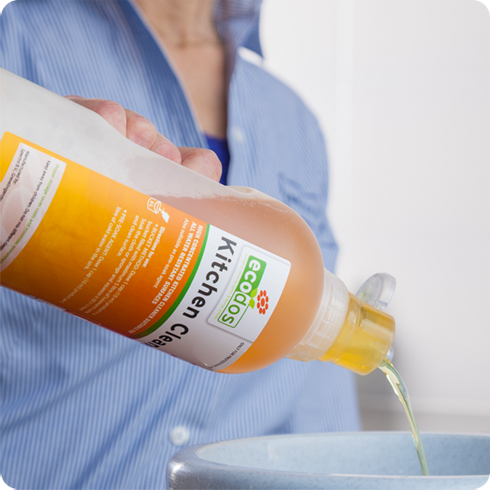 Highly concentrated, ecological cleaning agents (up to 5 times more concentrated than regular products) in easy to use dosage bottles for all daily professional cleaning in buildings, kitchens and Ecodet Laundry Detergent. The special caps on the dosage bottle give the required amount of product. The dosage bottles are made of 100% recycled plastic. Because we use clear colours, numbers and symbols the system is easy to use for everyone. The dosage bottles can be used everywhere and can be placed on practically all trolleys. Because the products are so concentrated, less transportation is needed, your stock can be lower and waste is reduced to an absolute minimum.